Did you take good notes in Getting Started? Remember to check with your doctor before starting or changing an exercise routine. Also, don’t get your fitness advice from a friend or relative unless you are certain they know what they are talking about. Just because someone is physically fit and exercises frequently doesn’t mean they know how to advise you. When you exercise, you take-in more oxygen. That is a good thing! However, the biggest win is that exercising helps with chronic pain. 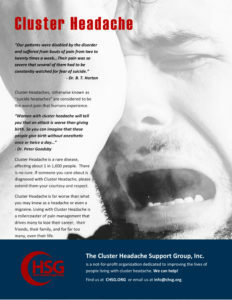 I’ve found that exercise done at just the right time can prevent that restless, irritable feeling and even help to prevent cluster headache some attacks. It doesn’t take much either. Fifteen minutes on the treadmill or 30 minutes of weight lifting and I’m pain-free for a few hours. Stretching is the movement of a joint or muscle to full extension by lengthening the tissues. When you stretch, you are stretching the tissues connecting muscle to bone. These connective tissues are made of collagen. Tendons are flexible cord-like structures that connect muscles to bone. Ligaments are tough bands of tissue that hold bones together. Aponeurosis are layers of flat broad tendons. Fasciae are fibrous tissues that separate muscles. Your stretching routine should be a regular routine. It should be practiced until it becomes a habit that you can do without thinking. To stretch effectively, you have to know your body. Do you have any old injuries? Is there something special you are training for, like a race, hike, or other event? If you get stuck, Mayo Clinic is a great resource for stretching ideas. Helps your muscles work more effectively. Stretching should not be painful. Support your body to prevent falls.